Marvel Is Announcing Something Big This Thursday, What Is It? Set your alarms Marvel fans, because something, possibly big, is coming tomorrow morning. The problem is, the folks at Marvel don't want to tell us what it is just yet. Marvel Entertainment seems to have something big that they are planning to reveal tomorrow morning, though, and they appear to be holding a live stream event of some kind in order to reveal whatever it is. The event was teased today by the official Marvel Entertainment Twitter account. Their caption simply said, "tomorrow," with an image that said, "save the date" under a massive Marvel logo with a message to "tune in" at 7 a.m. PST/10 a.m. EST. So, if you live on the west coast and just so happen to be a big Marvel fan, better set your alarm and be ready to get up early, because this feels like it could be something pretty major. That said, fans of the Marvel Cinematic Universe may want to temper their expectations slightly and not get their hopes up. Marvel Entertainment and Marvel Studios, the studio behind the MCU, both have different Twitter accounts now. At least as of this writing, the Marvel Studios Twitter account has not sent out anything related to this mysterious event, so there is no evidence that a big movie-related announcement is coming. That said, it doesn't at all rule out the possibility, either. Marvel did something very similar a couple of years ago when they held a big event in California announcing their Phase 3 lineup for the MCU, so there is precedent for a mysterious event of this type being on that level. Interestingly enough, directors Joe and Anthony Russo just started filming Avengers: Infinity War and Avengers 4 a couple of days ago, so now might be a perfect time to officially announce the cast and maybe give some details, which have largely been kept under wraps. There are a few things we can probably rule out. For one, don't expect a big announcement of the Phase 4 MCU lineup. Toward the end of last year, Marvel Studios President Kevin Feige said that revealing even any of the titles that are going to be a part of Phase 4 would be venturing into spoiler territory for Avengers: Infinity War and Avengers 4, so we probably won't be finding anything out in terms of specific movies for Phase 4 until both of those movies have hit theaters. It also seems unlikely that this will be a reveal for Thor: Ragnarok. Marvel probably wouldn't do anything this mysterious for that movie. They would probably just release a trailer online or do a debut on Jimmy Kimmel Live, which they are known to do. Outside of that, until we get some more information to go on, we are left to speculate. There is also a definite possibility that this could be comic related and that they could be announcing a big upcoming Marvel Comics event. It is also worth noting that director Ryan Coogler just started shooting Black Panther in Atlanta, so that could have something to do with this event as well. The tweet from Marvel didn't even say where to "tune in" specifically, but we can assume Twitter and since the Facebook account for Marvel put up the same message, we're guessing there as well. 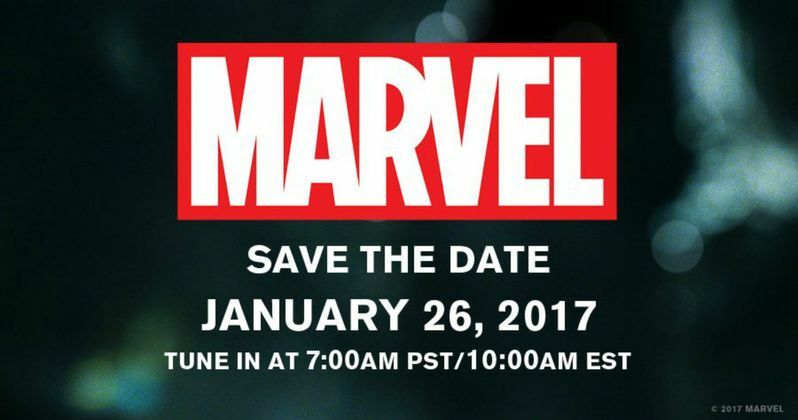 Be sure to tune in on Marvel's Facebook or Twitter tomorrow at 7 a.m. PST/10 a.m. EST to figure out what Marvel has up their sleeves.